What do new logos have to do with InterVarsity’s mission to see the transformation of youth, students and graduates, in all their ethnic diversity, into fully committed followers of Jesus Christ? We believe that with more unification in our visual identity, more young people will be able to find us at camp, in high schools and on university campuses across the country. As we work towards providing consistent care and development for youth ages 5-25, we have discovered one key obstacle. To be involved with us at camp, in high schools and on university campuses, youth need to be able to find us! Why has this been so difficult? For years now our camps and campus groups have operated with names and logos that, at first glance, might make them seem like stand-alone entities. Many young people who have been involved with our ministries did not know they were a part of a much bigger movement. So, when they outgrew our ministry at camp, for instance, they might not have known there was a similar community waiting for them at university. A community that could encourage them to flourish and grow in their relationship with Jesus. A community that could give them opportunities to develop as servant leaders. Likewise, when a student goes on to pursue a graduate degree they might not realize our campus ministry extends to graduates and faculty in the university. We want young people to know how to find us. A critical step in this process is aligning our names as well as our logos. 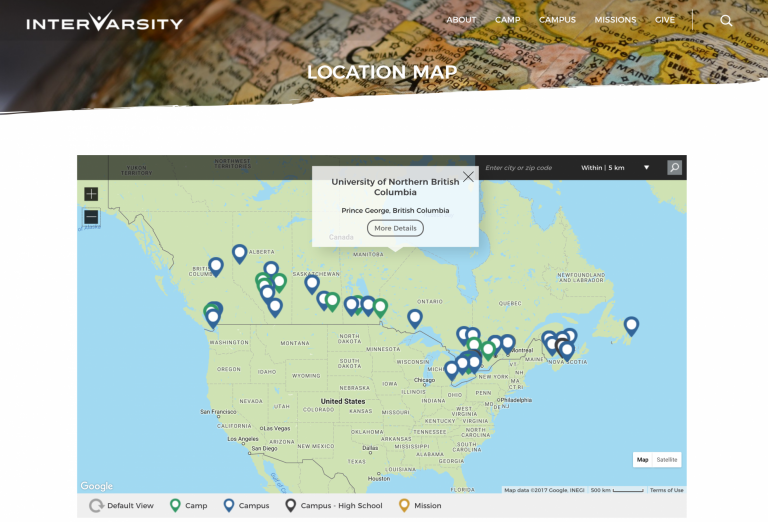 A fresh look for our national website that helps people easily find a camp or campus group near them. New logos at our high schools and universities that reflect the breadth of our ministry to students. New names for our campus groups so you can recognize InterVarsity on the campus near you. Throughout the fall, we will keep you updated as we continue to strengthen and align our ministries to better serve youth, students and graduates. As you look around in the upcoming months, we hope you will recognize InterVarsity more easily! I love the new look and the purpose behind it! Well done to all those who made this happen. As I see it, one would have to know Intervarsity was a Christian organzation, as it is not obvious from the logo. Hi Beverly, Thanks so much for your feedback. I want to assure you that our commitment to our Christian values and beliefs has not changed with the move to shortening our name. Many people over the years have referred to us by the acronym of IV or IVCF, which also did not communicate that we are a Christian mission. In every context where we use our name — websites, social media sites etc. — we are committed to making our Christian values and beliefs clear. Just wondering how taking the Christian Fellowship out of the name will help students recognize that this is a Christian family that they’re joining. The word intervarsity isn’t just a Christian connotation and could be used by many other organizations. How will new students who are Christians or exploring the Christian faith be able to better connect with ivcf now that it’s only IV? Hi Matthew, Thanks so much for your question — it’s one we have spent quite a bit of time discussing. Our name, InterVarsity, always appears in a particular context: newsletters, websites, social media sites, press releases and even people(when it appears on t-shirts or hats, for example). In all of these contexts we are always communicating that we are Christians. The context is what will help people who do not know us understand the bigger story about our Christian perspective, values and beliefs. As a relational organization, it’s always our goal to introduce ourselves by more than our name. Seems like most organizations that remove Christian from their name on watering things down to appeal to a broader crowd who does not want to come to something that seems exclusively Christian. Even if that is not where your organization is going for, it seems like from the other comments I’m not the only one that is getting that drift. Thank you for your feedback. Our commitment to our Christian values and beliefs has not changed. While we have shortened InterVarsity’s branded name we have not changed our purpose statement, our statement of beliefs, core values or mission. Our legal name continues to be Inter-Varsity Christian Fellowship of Canada. Our marketing materials, from our websites, to camp brochures to campus posters and banners, are always designed with the goal of being transparent and clear about who we are and what our message it: to introduce people to Jesus Christ and to help them become his followers. As a business man, and a Lead Pastor, I just want to say thanks for your vision and courage! I love the new logo. It seems to have open arms at the centre of things, whether a welcome to community, or to praise, it is going to be a great logo. People will soon come to connect the dots… those open arms lead to Christ! Well done! Thanks so much for your encouraging comments! Please pray with us that many, many students will join our communities on campuses this fall — there are lots of invitations being offered all across the country.